David Meerman Scott, founder of the Newsjacking movement, teaches the art and science of injecting your ideas into a breaking news story. Generate sales leads and add new customers. For free! Get media attention, With little effort! Grow your business. Faster than ever! And besides all that, there’s a bonus: Newsjacking is fun! For the past five years I’ve taught the newsjacking technique to hundreds of live audiences in over 20 countries. When I deliver a keynote presentation to an international audience, I charge $25,000. I’ve taken all I’ve learned about newsjacking and put it into the course, for just $450, a tiny fraction of my keynote fee. "Newsjacking has allowed our Southern California law firm to expand its sphere of influence from local to global. Our newsjacking efforts have resulted in expanded audiences and relationships we never before thought was possible. Interviews, commentary, and in the end, new clients and cases are the happy result of our newsjacking efforts. To make sure you go about newsjacking the right way, follow the advice of David Meerman Scott and get ready for the ride of your life!" "After David taught me his breakthrough concept of Newsjacking, I was able to grow my CashForPurses.com business from literally 0 to over 8,000 customers in a little over 6 weeks. This resulted in 6-figure revenue in a very short time, as well as major media and venture capital attention." 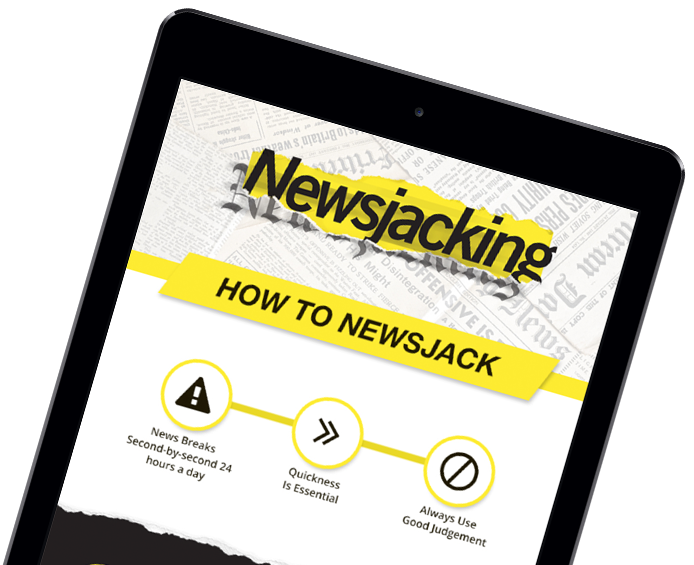 Get started newsjacking right now! download this free infographic to learn how. 5.4 Be Open to Serendipity! 5.5 A Quarter of a Million Dollars from One Newsjack! 7.5 What’s Your Legitimate Tie to the Story? 8.1 Are Large Corporations Doomed to Failure? I admit it: by nature, I'm a reader, not a viewer. I like books because their structure keeps me from getting lost. I'm frequently frustrated by online and video training because the key points just flow past me, like water from a firehouse. However, David Meerman Scott’s Master Newsjacking! 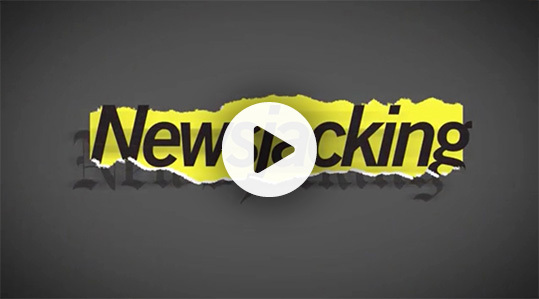 has not only convinced me to adopt a Newsjacking mindset -- inspiring me with powerful, documented examples and tools -- but it has demonstrated that video can be a far more powerful training tool than reading. Master Newsjacking! succeeds where most video programs fail because David has organized it into short, well-paced segments, each focused on a single, easily-remembered point. No two segments are alike, the pacing is always energetic, and they all end with a memorable and actionable key idea. The dashboard/navigation is superb: I can easily see where I've been, resume where I've left off, or repeat lessons. An added bonus: unlike the "afterthought" handouts that often accompany videos, the PDF's that accompany each lesson demonstrate as much planning, design, and craftsmanship as the videos themselves. With Master Newsjacking!, I not only have a better understanding of a marketing mindset and associated tools that can be the basis of my next career pivot, I now have a "gold standard" to aspire to when creating my own video training. Be prepared for positive change and new tools to achieve it. Thanks, David. I don't often post endorsements but I will here because I'm quickly understanding why newsjacking is such a powerful practice. The course is already doing it's job -- which is making me think about newsjacking in a habitual way. My bet is that newsjacking is especially valuable to those who work within corporate walls because it can start to free them from the confines of the often-rigid rules within -- while generating more attention and growth for the organization. Win/win. Meantime, know that I'm all in. You've got something exceptional here...perfect for our times. Newsjacking is a Game Changer! The approaches and techniques taught by David Meerman Scott in this course have allowed us to expand our California business from local to global. Breaking news is happening 24/7 around the world and there isn’t any reason why you can’t also harness the power of newsjacking to reach new audiences in ways and places that you’ve never before thought about. I recommend this course for anyone interested in expanding their sphere of influence and getting their song heard above all the noise. --Jon Mitchell Jackson, Esq.